Camy, you're one of those hard-working writers who started at the top with Zondervan. Share a bit of your road to publication with us. How did you find your house and agent? God really had His hand over the entire thing, because it was filled with so many chance meetings and coincidences. I had a very Bad Book that happened to have a good marketing hook--Asian American chick lit/romance. I went to the ACFW conference in Denver in 2004, intending to pitch to Karen Ball. I'd done my homework and researched the different Christian publishers, and Zondervan was my top choice because I thought that my marketing hook would fit in with their current titles. They had some chick lit but not a lot, so I thought they might be open to my Asian chick lit. However, Karen didn't go to that conference, and I ended up pitching to Sue Brower, who was Senior Marketing Director at the time. She heard "Asian chick lit" and was ecstatic. I sent the Bad Book to Zondervan, and it got rejected by a first reader. However, Sue championed me in-house because she liked my marketing hook. She held on to a copy of the manuscript and eventually (over a year later) got Karen to read the Bad Book, which I'm heartily embarrassed to admit. good communication styles. When I submitted to her, she took me on as her client right away. In the meantime, I happened to be at the Mount Hermon Writers Clinic visiting my friend Randy Ingermanson, and met up with Karen Ball. She wanted to know who my agent was, because she saw potential in the Asian chick lit angle, and I'd won the ACFW Noble Theme contest since then, so she had hopes my writing had improved. Karen is friends with Wendy from years of being in the publishing business together, so Karen, Sue and Wendy got their heads together. I had shelved the Bad Book, but written another manuscript, Sushi for One, as the first book in that series. I'd written three more manuscripts since the Bad Book and crammed as much writing craft knowledge into my head as I could, so Sushi for One was EONS better than the Bad Book. Karen and Sue took Sushi for One to their pub board and it passed through. This is why I'm such a proponent for writers conferences. It enables you to meet industry professionals and show them that you're not an ax-murderer. Also, it wasn't just my meeting with Sue, Karen, and Wendy--the reason Wendy sought me out is because other people had been talking to her about me. You never know how your contacts and friends at conferences can work in your favor later. Asian chick lit -- I think you're a trailblazer in that area. And while it is Asian chick lit, I found the story intriguing. I couldn't walk away from Lex. Did you work hard to make the book appeal to a broad audience or did it happen naturally? I actually put a lot of deliberation in this manuscript. I read a lot of chick lit, both in the CBA and ABA, and most chick lit is written in first person point of view. I like first person POV--it's fun and immediate. However, not everyone likes reading first person--many romance readers won't read romantic chick lit because of the first person POV. While chick lit has many fans, romance is the foremost seller in both CBA and ABA. And I love romance--90% of my reading is romance. My books had that chick lit bite to the characters and storyline, but they were all essentially romances. arc like in a women's fiction novel. I don't mind writing in third person, although I'd like to write in first person eventually. I'd done a lot of research on how to write deep third person POV, so I knew that a story written in good third person POV could be as immediate and emotional as a story written in first person. demographics as they write more and more manuscripts, and try to plan their stories around as broad a reader demographic as they can. Lex has some hard issues to deal with. One of those you bring up is reverse discrimination. Why did you think that was important to include in the book? I touched on it in the novel because it's real life. Just as not all Caucasian people are the same in their views and opinions, Asians aren't all the same. We all struggle with our own issues of race and identity. Even readers who aren't Asian will relate to some of Lex's struggles and issues. Aiden is a man with issues of his own. Yet his soft touch with Lex was amazing. What aspect of his character did you find hardest to write. Aiden is a bit like me in that he likes being able to control the things around him. He doesn't freak out like I do when he can't control things, but he still likes that sense of order and control. The fact that he can't control things--that God is the only one who can--is an issue I deal with all the time. His scenes were difficult at times because they too closely mirrored my own questions and frustrations. What do you hope readers glean from this fun story? Entertainment! 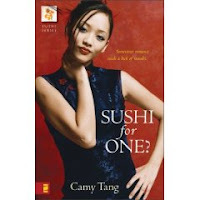 I wrote Sushi for One as a fun, flirty, fluffy book, a fast-paced, entertaining ride. I wrote the entire Sushi Series with the family and cultural issues of an Amy Tan book, but with the humor and romance of Bridget Jones. This is the first book in a series. What's next? Only Uni is Trish's story, and it comes out in February 2008. Then Venus's story is Single Sashimi, scheduled for release in the Fall of 2008. Thanks for the opportunity to be here with you, Cara! Thanks for joining me. And Guys, run out and join her yahoo group. It's a fantastic contest! And then buy the book. You won't be disappointed. Also leave a comment and you'll be entered in the contest for a copy of this fabulous book! Okay, now - this book likes some serious fun! Sign me up please! Thanks so much for the interview, Cara! CFBA Tour: Sushi for One?